ACCORDING TO THE GOSPELS, Jesus had several “brothers and sisters” (see “Mary” for possible meanings), but James and Jude are the only ones mentioned elsewhere in the New Testament—James as a leader of the early church in Jerusalem, and Jude in the short letter bearing his name. Originally, Jesus’ family was skeptical of his ministry: “Even his brothers did not believe in him,” says John’s Gospel. Apparently the Resurrection changed their minds, because they joined Mary and the disciples in the Upper Room to wait for the Holy Spirit. James, probably the oldest of Jesus’ brothers, made the decision at the Jerusalem Council that Gentile Christians did not have to obey ancient Jewish laws. He may have lived an ascetic life and was reported to have spent so much time in prayer that his knees “were like those of a camel.” Jewish historian Josephus reported that Jewish leaders stoned James to death. Eusebius said he was thrown from the top of the temple and beaten to death with a club. It is unclear whether this James or another wrote the epistle bearing his name. Jude’s letter of warning about impostors who had infiltrated the church suggests that he, too, became a respected church leader and perhaps a traveling missionary who saw such problems firsthand. After the Gospels, the New Testament rarely mentions the disciples. For further details, we have only legends—some dubious. Peter’s brother, Andrew, reportedly preached in Asia Minor, Thrace, and Greece before being crucified on (according to a tenth-century account) an X-shaped cross. He was regarded as the founder of the church in Constantinople and may have been associated with writing the Gospel of John. The apocryphal Acts of St. Andrew (from the second century) claims he was imprisoned for advocating an ascetic life. Philip was from Zebedee’s home town of Bethsaida. He supposedly became a missionary to Turkey, where he died a martyr. Some accounts say Bartholomew (probably actually named Nathaniel Bar-Tholomai, meaning “son of Tholomai") was a companion of Andrew and martyr among the Parthians (in modern northeast Iran). More commonly, he is said to have taken the gospel to India, where he was tortured and beheaded. Eusebius mentions that someone found Matthew’s Gospel in India, which may have been left there by Bartholomew. Or maybe it was left there by Thomas, whom Gregory of Nazianzus and the Acts of Thomas say preached in India and was martyred there. The Syrian Christians of Malabar (in southwest India) are still convinced they were evangelized by Thomas. In any event, he likely would have preferred his first nickname, “the twin,” to his more modern “doubting Thomas.” He is associated with Syriac Christianity, and (if he didn’t go to India) is also reported to have taken the gospel as far as Parthia and Persia. Matthew is credited with writing the Gospel bearing his name and is said to have ministered in Ethiopia, Macedonia, Pontus, or Persia before dying a martyr. Simon the Zealot and Judas the son of James (also called Thaddaeus) are said to have gone to Persia together, where they were martyred. James the son of Alphaeus (who may have also been “James the Less") disappeared from history. Stephen M. Miller is a freelance writer and former editor of Illustrated Bible Life. He is an editorial adviser for Christian History. Stephen Miller is also the author of Misguiding Lights. The Ecole Glossary. Unfortunately, its entries are much shorter. Jesus’ humiliation didn’t end at the cross. Interview — Galilean Rabbi or Universal Lord? 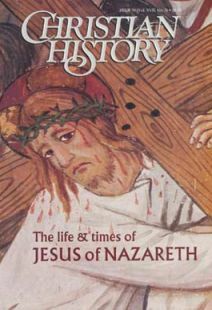 Despite earlier failings, the quest for the historical Jesus still matters.